Maria Teresia ordered the planting of trees on the uncultivated area and willow in the marsh on the area of today’s City Park Lake. Creating the Beauty Commission at the time of József nádor (Joseph Palatine) the City of Pest planted group of trees on the border of the city, this land of over three hundred hectares. He showed much affection for the City Park, which was made more beautiful and which improved right from the beginning, so that the public park offers a pleasant environment for relaxation and entertainment for the citizens. The palatine had the planetrees transported from his own land in Alcsút, which have by now grown huge. The City Park had become a popular meeting place by the time before the Compromise, satisfying the needs of all social strata. Different sports found their home here also at this time. 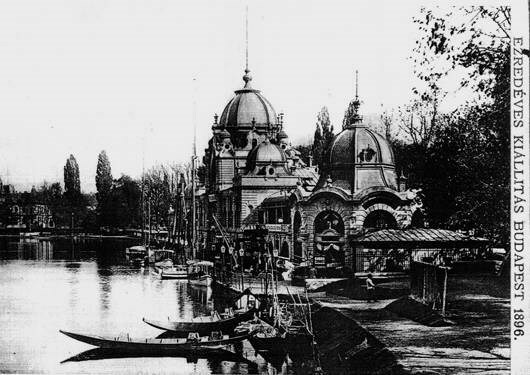 The upper class soon grew fond of boating on the lake in the City Park, as the romantic atmosphere attracted the ladies and the gentlemen could prove their physical fitness by rowing to please the ladies. During winter the skaters also appeared on the frozen lake. No better recreation park in today’s terms could have been found. Many of the business elite supported the idea of skating, which offered an excellent social entertainment for the winter months. On 12 November 1869 the foundation of the Pest Skating Union was announced under the chairmanship of Géza Kresz in the gaming room of Steingasser (Petôfi) Coffee House on the Danube. 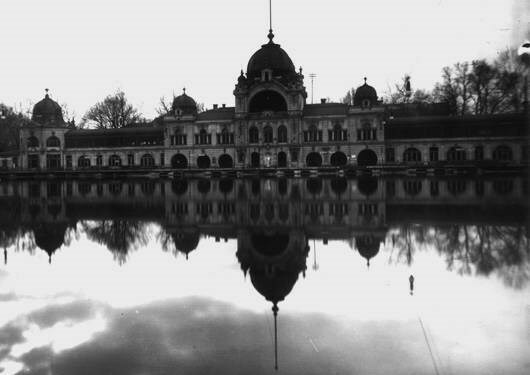 As a result of a persistent intervention the city council agreed to use a part of the lake as an ice rink, free of charge. The first-ever ‘skating house’ was formed when a two-room wooden cottage was built on the lake shore. On 29 January 1870 the Ice Rink was finally inaugurated in the presence of Prince Rudolf The skating life got on way with enthusiastic dynamism after the opening. Different events with lampions were held after one another. On 2 February the firstever competition took place. After the building burnt down in winter 1874, the capital agreed to have a standard building built. The design and the erection of the new building is a masterpiece by Ödön Lechner. In the ornamented grand hall of the main building the parents and the chaperons could wait and enjoy the splendid panorama. The room for skate binding operated under it, as did the room to warm up on the ground-floor. The music room was located upstairs as a kind of a cupola. At that time there was hardly any public room in the capital with better acoustics. Skating was enjoyed with huge enthusiasm shown by the inhabitants. Seven years after the inauguration of the hall a further extension was of great priority! This exceptional enthusiasm was well justified as no other outdoor ice rink with such a large surface has been built since in any corner of the world. The exceptional natural and cultural environment have naturally contributed to the success of the facility. 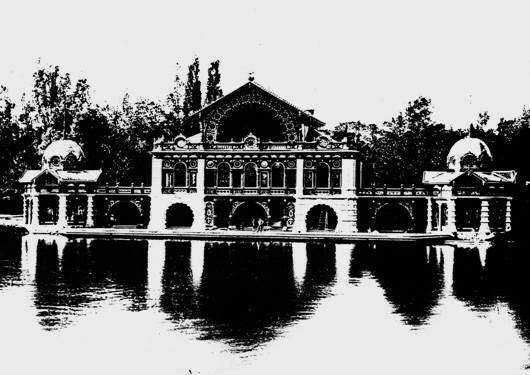 In 1895 a new building was built in neo-baroque style according to the plans of Francsek, Imre Sen., imultaneously with the building works the regulation works of the lake also started. 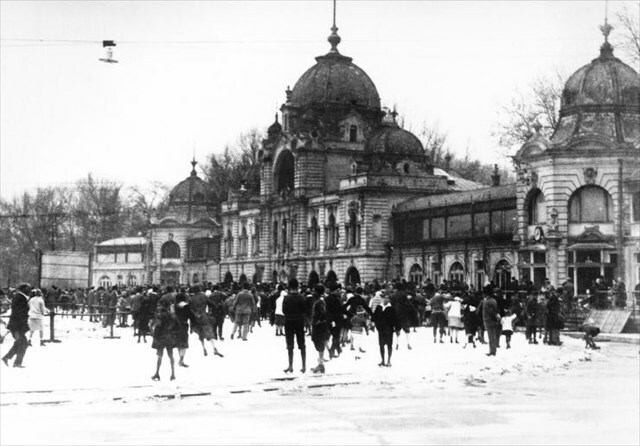 After Vienna, Budapest was the second in Europe to have an artificial ice rink built in 1926. The last major enlargement was in 1968, when the ice surface was extended. Park When wondering about the tourist attractions offered by Budapest, you can hardly avoid mentioning any area similar to the City Park, where visitors of differing ages and arriving with different predilections can find such a wide range of possibilities for entertainment and relaxation. A young or mature, traveller fond of active relaxation, pleasant walks, or wanting to have a cultural experience – can experience here that which is appropriate to him. On arriving from the downtown area, on Andrássy Boulevard you cannot but fail to encounter an atmosphere at the end of the road, which is completely different from your starting point. The sculpture symbolizing Gabriel archangel on top of the 36 m high Corinthian column on the Heroes Square can be noticed already from a distance. No wonder Andrássy Boulevard and the historic surrounding with the Heroes’ Square form part of UNES CO’s World Heritage. Having reached the Millennium Monument, you can continue exploring the richness of many cultural treasures on both sides of the square at the Museum of Fine Arts and in the Institute of Contemporary Arts. Those fond of active relaxation can pause here, as the Artificial Ice Rink is very tempting to go skating during winter, yet it can offer further sporting and entertainment opportunities throughout the year. The offer on museums is further completed with the Museum of Agriculture and the Museum of Transportation. The Vajdahunyad Castle adds a special atmosphere as it takes you for an interesting ride in time mixing the different ages and styles on purpose. It is only a brief a 5-minute walk from Heroes’ Square when you reach the Széchenyi Bath which has been in existence since 1913. It is a delight, especially during the winter months, to warm up in the outdoor spa with its 36 °C thermal water. 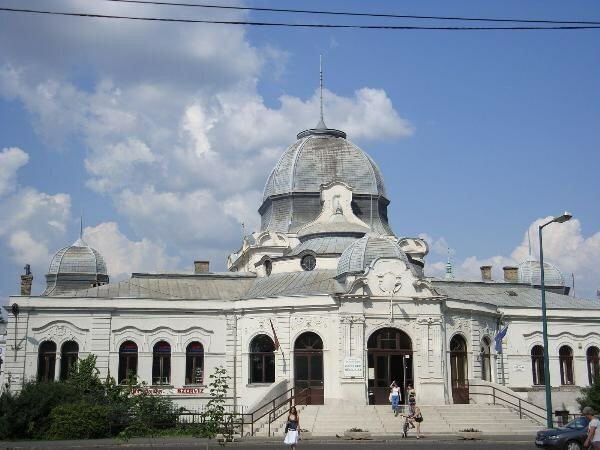 The Budapest Zoo and Botanical Garden strive to present the domestic and foreign breeds and species with ever growing care and for ensuring varied entertainment for the young with the play house built within the zoo area. The Entertainment Park is located just next door to the zoo, where you can enjoy the classic units from the last century and also versions of their state of the art. The Budapest Circus entertains spectators with magic spectacles. But do not forget about the culinary delights either. The tourists can hardly find any other fancier restaurant in town than that by Gundel built next to the Zoo or Restaurant Robinson opposite to it and on the lake. Historic environment Similar to the excellent transportation connection the Ice Rink’s history is also exceptional. 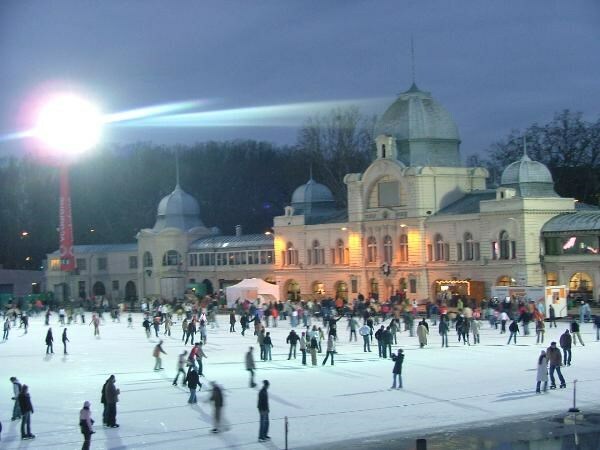 You will sense a rare atmosphere if you skate on the ice just a few ten hundred metres from the wall of the 100-year-old Vajdahunyad Castle. When the white ice outshines the lights illuminating the rink, and the lines of the castle appear mysteriously in the background; pedestrians sweep the sporting public with curious eyes from the bridge on the other side. Nothing can better serve as a symbol of healthy lifestyle than a parkland with green areas, meadows, and so full of trees, yet free from traffic. 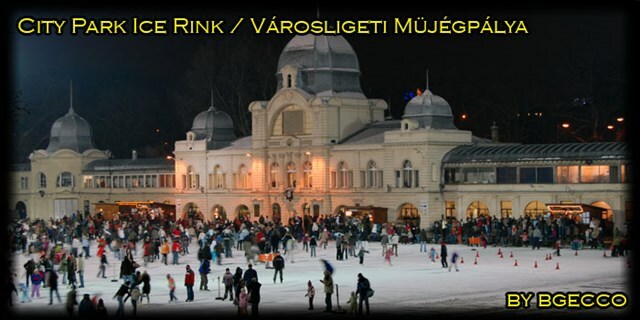 This is the outdoor artificial ice rink with the biggest area and the longest history in Europe. During winter ice sport lovers have a total area of 12,000 square metres at their disposal, while sport and cultural events are offered to the visitors from spring till autumn. 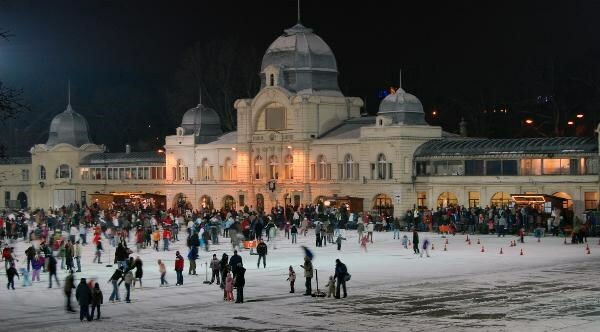 The ice rink has been a public institution since the very beginning, it falls under the management of the Municipality of Budapest since 1996. The Ice Rink is managed partly from its incomes, party from the subsidy of the Municipality of Budapest, on about a 50-50 percent basis. The number of visitors at the Ice Rink is growing year by year thanks to the institution’s activity to make the sport of skating more popular. The target is to make skating, as a leisure time activity loved in the widest circle possible, and to provide of the sport of skating, to ensure training possibility for the competitors. The facility underwent an immense reconstruction in the second half of the forties, when it was required following war damages. (This was not a complete one, as the left wing, which was bombed, is still missing from the building even today.) The long-expected complete reconstruction started in November 2005, whereby the technical building was finished and opened in October 2006 in the first phase. A year later the complete reconstruction of the rink will commence and a year afterwards the final phase. Az üzleti élet méltóságai közül többen is támogatták a korcsolyázás ötletét, amely a téli hónapokra remek társasági szórakozást nyújtott. 1869. november 12-én a dunaparti Steingasser (Petofi) kávéház kártyatermében, Kresz Géza vezetésével bejelentették a Pesti Korcsolyázó Egylet megalakulását. Kitartó közbenjárás után a városi tanács engedélyezte a tó egy kis részének korcsolyapályaként való használatát, díjtalanul. Az elso "korcsolyacsarnokot" a tó partján felállított kéthelyiséges kis fabódé testesítette meg. 1870. január 29-én Rudolf koronaherceg jelenlétében végre megnyitották a Jégpályát. A megnyitó után nagy lendülettel indult útjára a korcsolyások élete. Egymást érték a különbözo ünnepségek, kivilágítások, lampionos menetek. Február másodikán megrendezték az elso versenyt. Miután 1874 telén az épület leégett, a fováros engedélyezte a végleges építkezést. Az új épület tervezése és kivitelezése is Lechner Ödön munkáját dicsérte. A foépület díszes nagytermében a szülok és gardedámok várakozhattak és élvezhették a pazar kilátást. E terem alatt muködött a korcsolyaköto helység, ugyanígy a földszinten, a melegedo. Fenn kupolaként terpeszkedett a zenekari terem, amelynél kifogástalanabb akusztikájú nyilvános zenekari helyiség alig akadt a fovárosban abban az idoben. Óriási lelkesedés kísérte a korcsolyázást a fovárosiak körében. Mindössze hét évvel a csarnok megnyitása után már égeto szükség mutatkozott a további bovítésre! A kivételes lelkesedést az indokolta, hogy ekkora összefüggo területu, szabadtéri mujégpályát a mai napig sem építettek sehol a világon! A pálya sikeréhez természetesen hozzájárul a párját ritkító természeti és kulturális környezet is. Kezdetben nem voltak versenyszabályok a Városligeti jégen. A korabeli híradásokból kiderül, hogy ötletszeruen rendeztek versenyeket. Ezek az események ünnepségek keretében, foleg az ügyességet voltak hivatottak lemérni. A díjazások is ennek megfeleloen különböztek egymástól és a mai megszokott éremrendszertol eltértek. Tehát a magyar gyorskorcsolyázás elso versenyének azt az eseményt tekintjük, amelyen a résztvevo hölgyek és urak a jégpályán fel - és visszakorcsolyáztak. A Nemzetközi Korcsolyázó Szövetség (ISU) 1892-es megalakulását követoen, 1893. február 8-án már teljesen szabályos gyorskorcsolya versenyt rendeztek a Városligetben, bár ekkor még nem gyorskorcsolyával, hanem rövid korcsolyával álltak rajthoz. Eloször 1894-ben hoztak be Magyarországra gyorskorcsolyát. Így megkezdodhettek a rendszeres edzések. 1895-ben id. Francsek Imre tervei alapján neobarokk stílusú új épületet emeltek, és az építkezéssel egyidejuleg megkezdodtek a tó szabályozási munkálatai is. Magyarország elso gyorskorcsolya bajnokát Péczeli Andor személyében, 1900. januárjában avatták. 1908. december 27-én alakult meg a Magyar Országos Korcsolyázó Szövetség. Az újonnan alakult szövetség és a BKE 1909. hanuár 23-24-én együtt rendezte a Noi Mukorcsolya Világbajnokságot és a Gyorskorcsolya Európa- bajnokságot a Városligeti tó jegén. Eme rangos események magyar dicsoséget jelentettek: Kronberger Lili mukorcsolyában világbajnok lett, Mannó Miltiadesz pedig az 5. helyet szerezte meg a gyorskorcsolyázás 500 m-es távján. Kétségtelen, hogy a jeges sportágak magyarországi fejlodésében nagyon nagy elorelépést jelentett a Városligeti Mujégpálya megnyitása. Bécset követve, Európában másodikként Budapesten került sor a Mujégpálya megépítésére, 1926- ban. Az 1944-es bombázások a jégpályát sem kímélték. A Városligeti Mujégpálya súlyos károkat szenvedett úgy, hogy 1945-ben már nem lehetett használni. A háború után a MOKSZ és a BKE új elnöke, Szalay Sándor irányításával hatalmas munkába kezdtek a jégpálya helyreállítása érdekében. 1968-ban volt az utolsó nagy bovítés, amikor megnövelték a jég területét. A Városligeti Mujégpálya napjainkban. A kituno közlekedési lehetoségekhez hasonlóan egyedülálló a Mujégpálya történelmi környezete is. Nem mindennapi hangulatot élhetünk át, ha a több mint 100 éves Vajdahunyad vár falaitól mindössze néhány tíz méterre korcsolyaélen siklunk a jégen. A pályákat megvilágító reflektorok fényénél is erosebben vakít a hófehér jég, a háttérben sejtelmesen áll a vár, a túloldalt átívelo hídról pedig kíváncsi tekintetek pásztázzák a sportoló közönséget. Az egészséges életmódot, mi sem hivatott hívebben tükrözni, mint a jármuforgalomtól mentes, zöld területekkel, rétekkel és fákkal teli Liget. Európában ez a legnagyobb területu és legtávolabbi múltra visszatekinto összefüggo szabadtéri mujégpálya. Telenként 12.000 négyzetméteren várja a jeges sport szerelmeseit, tavasztól oszig sport- és kulturális jellegu rendezvényeket kínál a látogatók számára. A Mujégpálya, mint sport- és szabadidos intézmény Jégpálya a kezdetek óta köztulajdonú intézmény, 1996 óta a Fovárosi Önkormányzat kezelésében áll. Fenntartása részben bevételeibol, részben fovárosi támogatásból valósul meg, körülbelül 50-50% arányban. A Mujégpálya látogatottsága az intézmény korcsolyasportot népszerusíto munkájának hatására évrol évre növekszik. A cél változatlan, a korcsolyázás, mint szabadidos tevékenység egyre szélesebb köru megkedveltetése, valamint a korcsolyasport oktatása, a versenyzok részére edzési lehetoség biztosítása. Az intézmény nagy rekonstrukciója utoljára a negyvenes évek második felében zajlott, amikor a háború pusztításai ezt megkövetelték. (Ez sem volt teljes, hiszen a lebombázott bal szárny a mai napig is hiányzik az épületbol.) A régóta várt teljes rekonstrukció 2005 novemberében kezdodhetett el. Ennek során az elso ütemben a 2006 októberében átadott technológiai épület készült el. Ez után indulhat el a pálya teljes felújítása, majd egy év múlva rá az épület átépítése. Megközelítés: Kis földalattival (M1) - Hosök tere megállóig, majd gyalog körübelül két percre a Mucsarnok mellett. RA: Zntargvp, 1,8 zrgref uvtu.